This really is the rescue remedy for dry, hard, cracked heels. Hand Chemistry Heel Hydration Complex will give you a quick fix whilst also hydrating your feet deep below the surface to stop the hard, cracked skin reappearing. 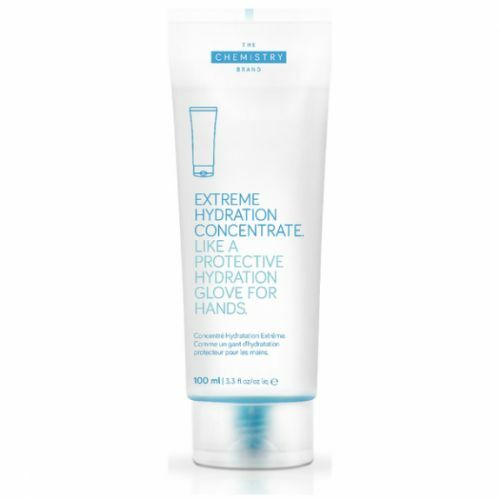 Containing 19.5% active ingredients this will transform you feet. Use daily for at least 14 days to see a 90% increase in skin hydration. Aqua (Water), Propanediol, Caprylic/Capric Triglyceride, Cetearyl Glucoside, Cetearyl Alcohol, Cyclopentasiloxane, Cetyl Alcohol, Glycerin, Alanine, Proline, Serine, Tremella Fuciformis Sporocarp Extract, Pseudoalteromonas Ferment Extract, Calendula Officinalis Flower Extract, Glycine Soja (Soybean) Oil, Tocopherol, Betaine, Dimethicone/Vinyl Dimethicone Crosspolymer, Acrylates Copolymer, Sodium Polyacrylate, Hydroxypropylcellulose, Cellulose, Xanthan Gum, Menthol, Menthyl Lactate, Methyl Diisopropyl Propionamide, Ethyl Menthane Carboxamide, Propylene Glycol, Sodium Phosphate, Sodium Hydroxide, Potassium Sorbate, Ethylhexylglycerin, Caprylyl Glycol, Phenoxyethanol, Chlorphenesin, Parfum (Fragrance), Limonene, Linalool. Massage into feet and heels on a daily basis. If you can pop a pair of socks on for a bit after applying to help deliver the moisture deeper.